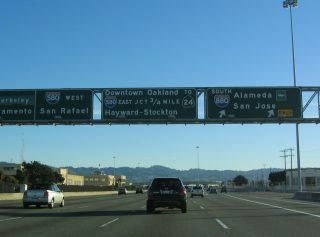 Generally following the eastern shore of the San Francisco Bay, Interstate 880 is the Nimitz Freeway between San Jose and Oakland. 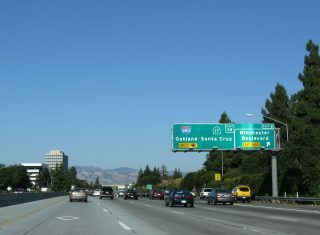 A heavily developed urban and suburban freeway, I-880 originates at the exchange with Interstate 280 (Junipero Sierra Freeway) and State Route 17 located in San Jose between the Fruitdale and Burbank communities. 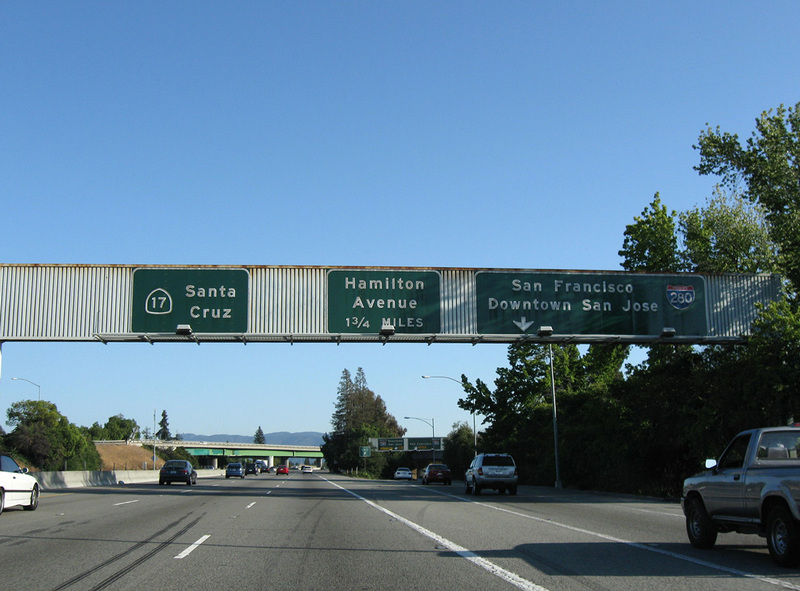 Heading northward, the Nimitz Freeway passes through an array of cities including Milipitas, Fremont and Hayward. 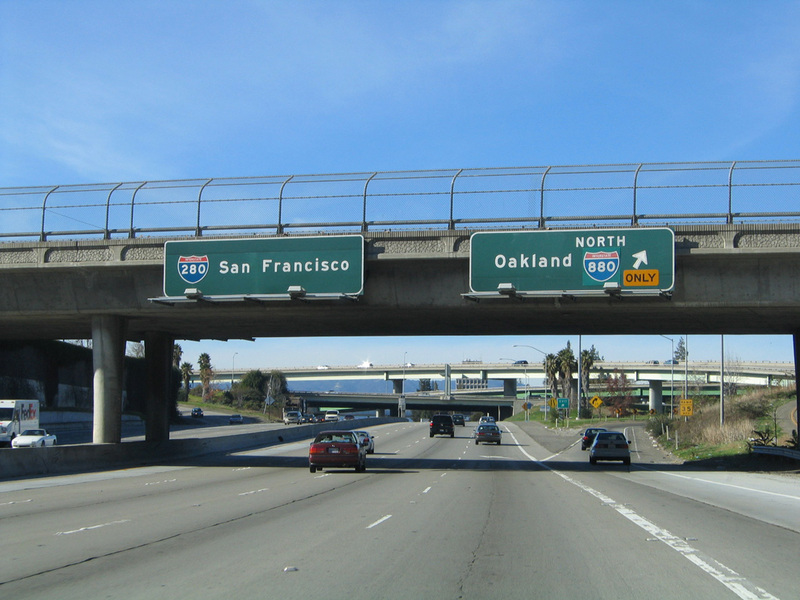 Extending north between Alameda and Downtown Oakland, I-880 concludes at the Maze Interchange with I-80 and I-580 at the eastern approach to the San Francisco-Oakland Bay Bridge. 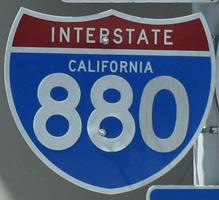 Interstate 880 was originally assigned to the section of I-80 bypassing Sacramento to the north between 1963 and 1980. During that time frame, I-80 was assigned to U.S. 50 and Business Loop I-80 (Elvas Freeway) through the capital city. Cancellation of a project to construct an Interstate standard section of freeway northeast of the American River resulted in the relocation of Interstate 80 over what was I-880. This change was approved by the American Association of State Highway and Transportation Officials (AASHTO) on November 14, 1980. 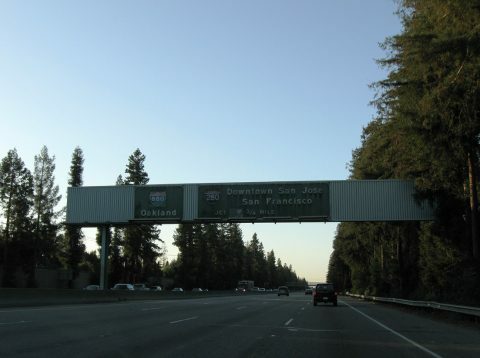 Federal Highway Administration action in 1983, followed by passage of State Assembly Bill 2741 in 1984, reassigned the Nimitz Freeway (State Route 17) from San Jose north to Oakland as the new Interstate 880. 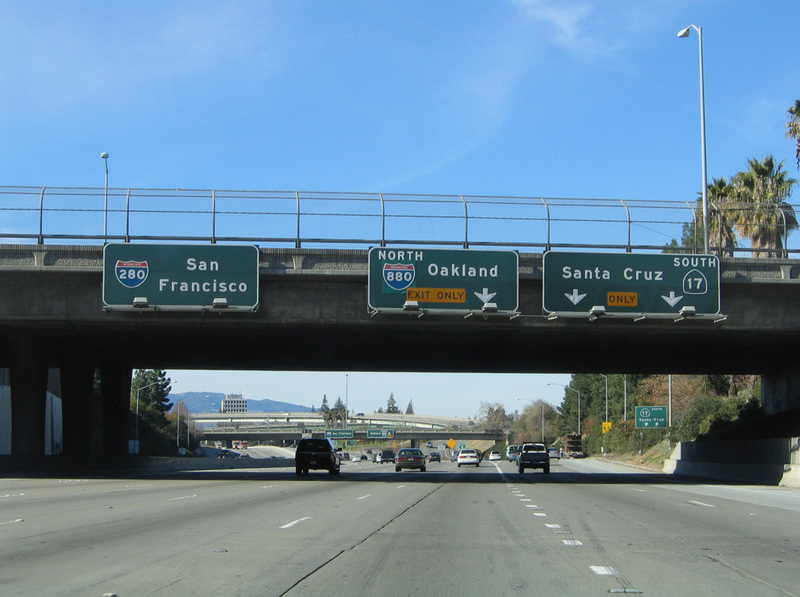 AASHTO approved the establishment of I-880 on June 20, 1983, and the route was completely signed by 1985. SR 17 remains designated south of I-280 and I-880 to Santa Cruz. The Cypress Structure along the Nimitz Freeway in Oakland was severely damaged during the 1989 Loma Prieta earthquake. Several sections of the double-decked section collapsed during the tragedy, resulting in the deaths of 42 people. The multi level structure was subsequently demolished. 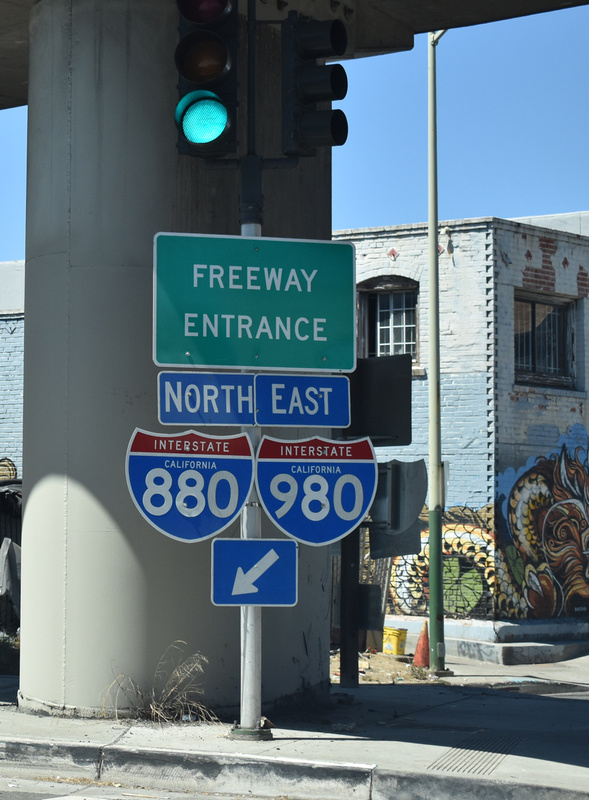 Ensuing work reconstructed I-880, partially on a new alignment which opened in mid-1997. The link with I-80/580 at the Maze Interchange was opened by 1999. Community input was taken to ensure that the new Cypress Freeway would be less intrusive to Oakland neighborhoods. Additionally, the former two tier section of the Nimitz Freeway was reconstructed into a viaduct with side by side roadways. 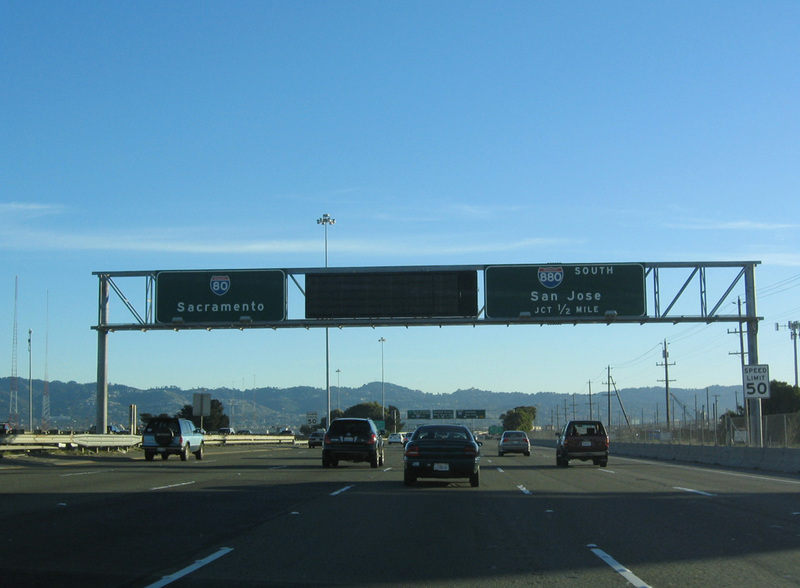 Between 1991 and 2010, Interstate 880 a wide variety of improvements took place throughout the Nimitz Freeway. 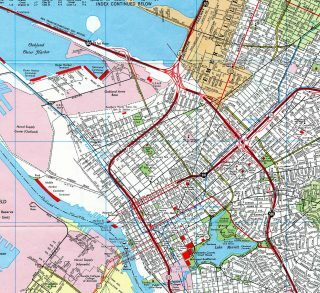 Some of the improvements were the result of the disastrous Loma Prieta Earthquake, while others were designed to improve capacity and safety implicit in an Interstate highway. Federal, state, and local funds paid for these upgrades. 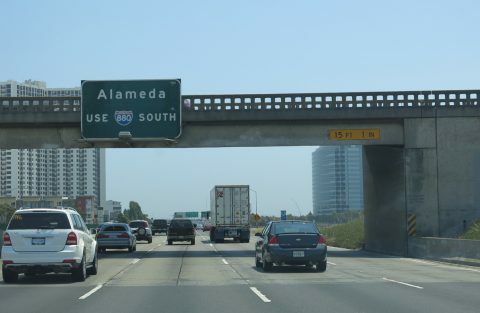 Both Santa Clara and Alameda Counties passed transportation sales tax measures, with some proceeds earmarked toward I-880. 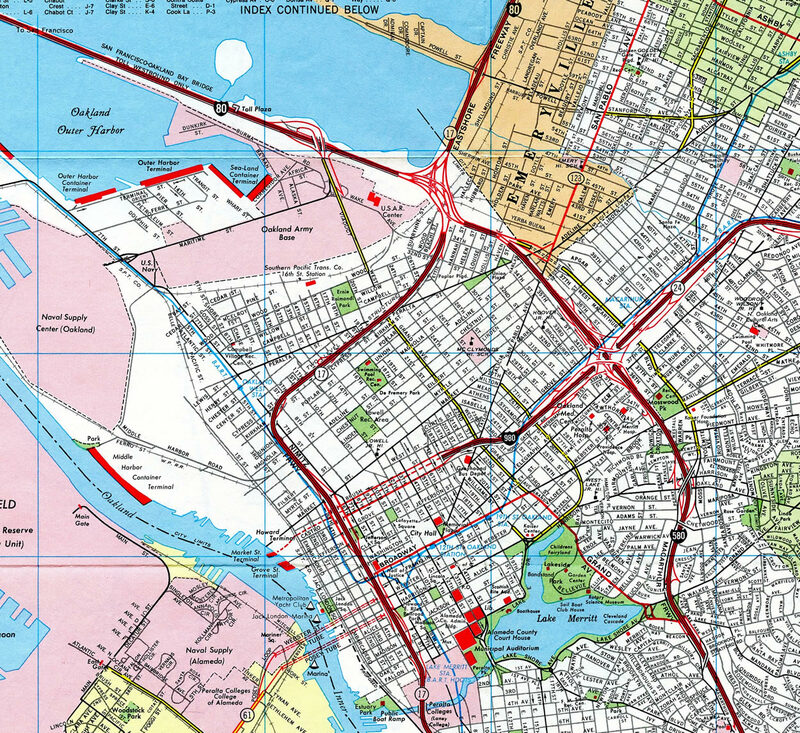 The original course of the Nimitz Freeway through Oakland in 1977. 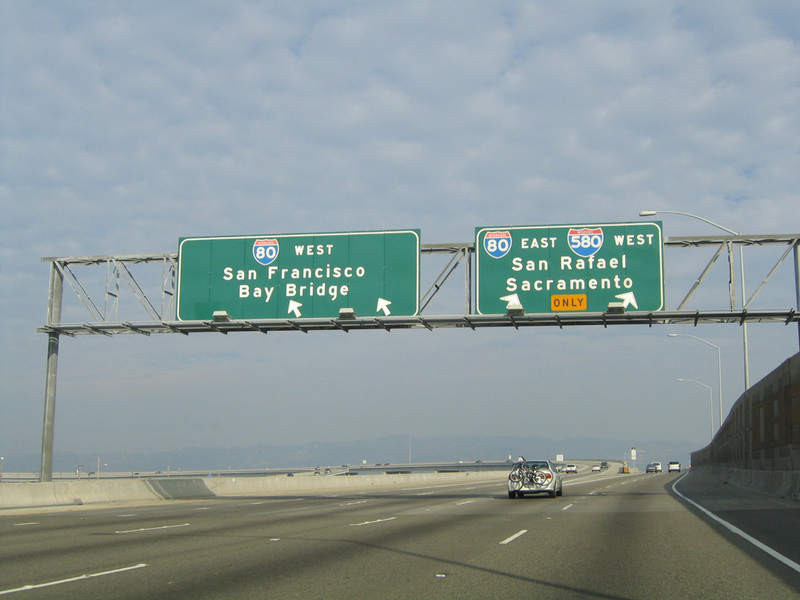 Interstate 980 was completed west to I-880 in 1985. 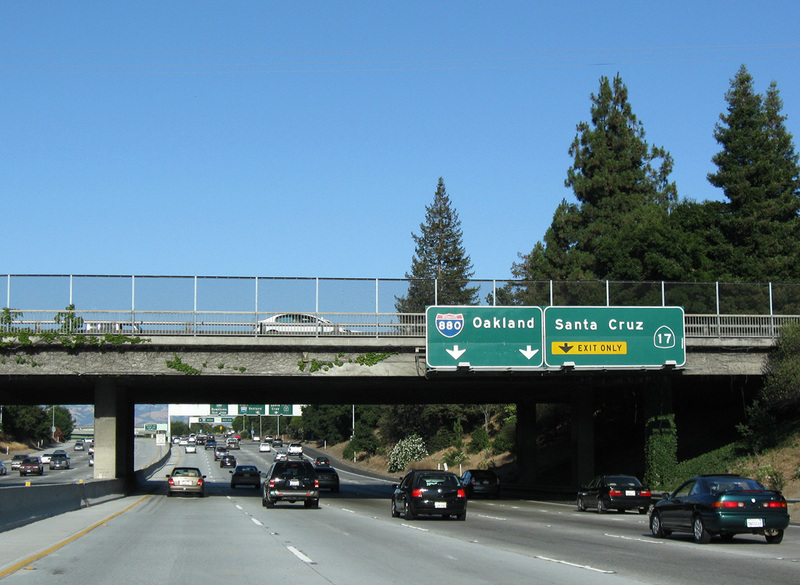 I-880 north from I-980 was closed four years later due to the Loma Prieta earthquake. Interstate 980 took over as the through route to I-580 until the completion of the Cypress Freeway. There are currently no plans to extend Interstate 880 further south over State Route 17. Only the section of SR 17 from I-280 to SR 85 is Interstate-standard. 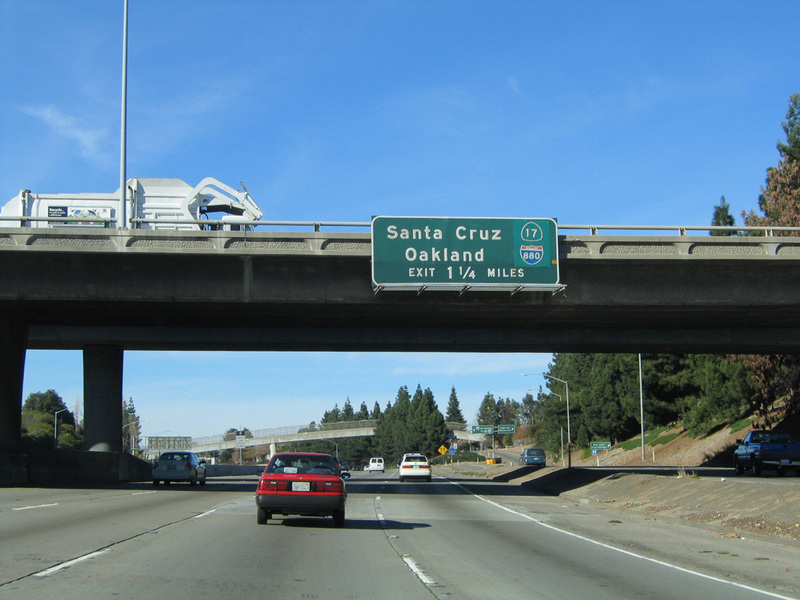 The rest of the route to Santa Cruz is substandard, with cross traffic, limited sight distance and narrow medians. 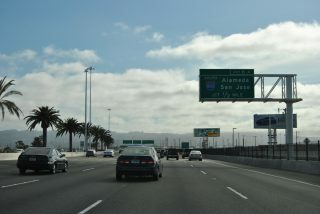 Interstate 880 navigates around a pronounced curve north from the 7th Street off-ramp (Exit 44) to the split with the San Francisco-Oakland Bay Bridge connector at Exit 46A. These signs were replaced in 2016. Photo taken 11/26/04. 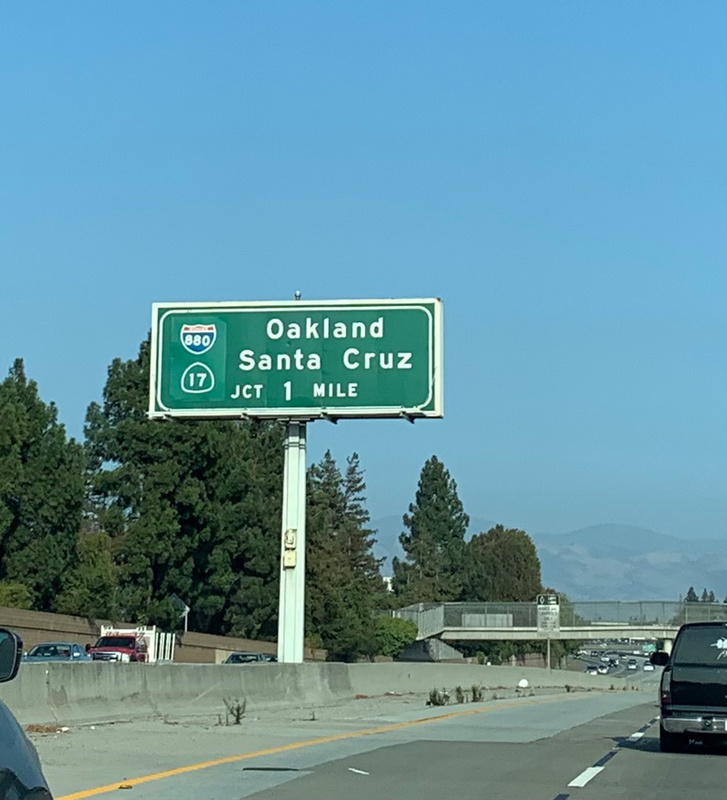 Northbound Interstate 880 (Cypress Freeway) partitions into separate roadways for Interstate 80 west to San Francisco (Exit 46A) and Interstate 80 east & 580 west to Sacramento and San Rafael in Marin County (Exit 46B). Photo taken 11/26/04. This section of Interstate 880 was completed in the late 1990s as part of the Cypress Freeway. 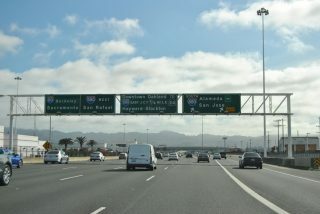 The northbound flyover (Exit 46B) to the Eastshore Freeway (I-80/580) at Emeryville extends 1.6 miles through the Maze Interchange ahead of Berkeley. Photo taken 11/26/04. 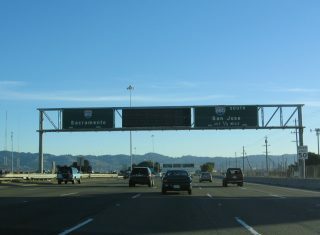 The first sign for Interstate 880 appears within the directional T interchange joining the Eastshore Freeway (I-80 west/580 east) with SR 13 in Berkeley. Photo taken 07/02/13. 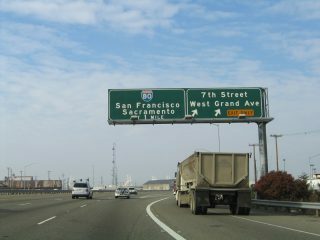 Exit 9 departs for Powell Street and Emeryville from I-80/580 just north of the Maze Interchange with I-880 (Cypress Freeway) south and the MacArthur Freeway east. These overheads were replaced in 2017. Photo taken 07/02/13. 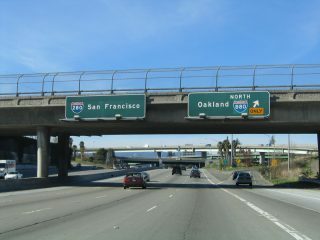 Interstate 580 separates with I-80 westbound for the MacArthur Freeway along the east side of Oakland. 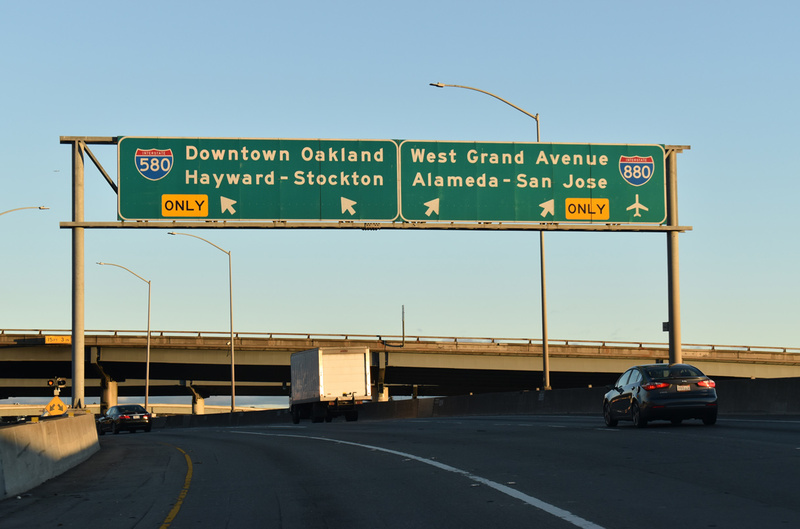 A weight restriction along I-580 east beyound Grand Avenue relegates trucks over 4.5 tons to use I-880 south to I-238 toward the Central Valley. Photo taken 07/02/13. 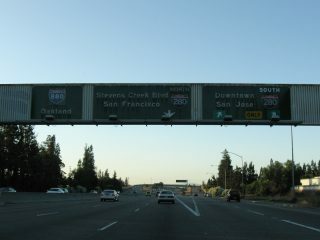 A flyover departs for the continuation of the I-80 carpool lanes westbound to the San Francisco-Oakland Bay Bridge. The succeeding ramps depart for I-580 to I-980 and Downtown Oakland and I-880 (Nimitz Freeway) south from Alameda to San Jose. Photo taken 07/02/13. 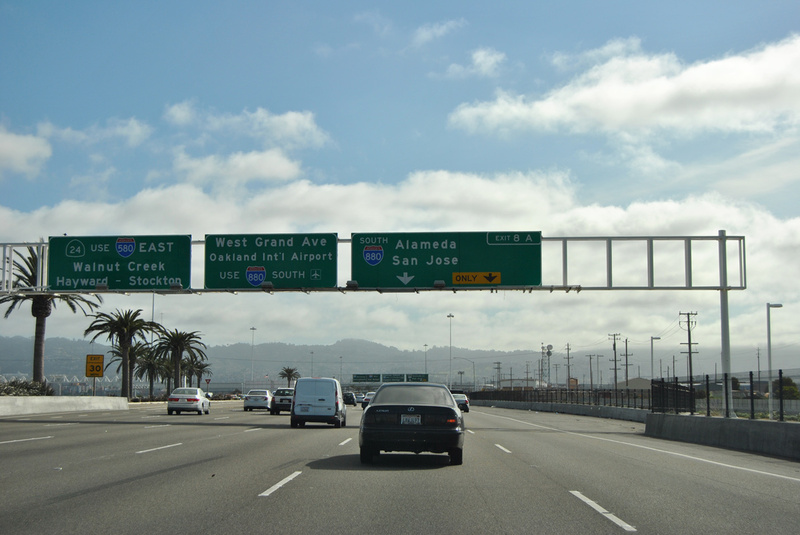 Interstate 880 runs along the west side of Oakland from the Maze Interchange toward Alameda. I-580 (MacArthur Freeway) connects I-80 with SR 24 (Glen Shafter Freeway) east to Walnut Creek in 1.5 miles. Photo taken 07/02/13. Interstate 80 leaves the San Francisco-Oakland Bay Bridge a half mile ahead of Exit 8A for Interstate 880 (Cypress Freeway) south. 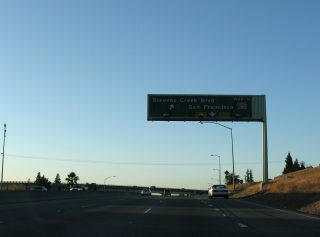 The connection to I-880 was reconstructed in the early 1990s as a result of damage from the 1989 Loma Prieta Earthquake. The freeway follows a looping course around neighborhoods that it previously cut through. Photo taken 03/27/16. 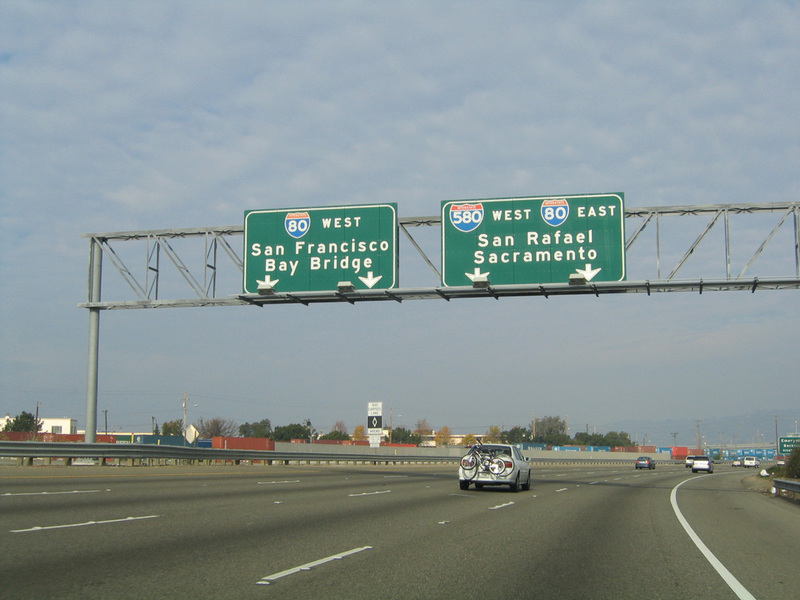 The north end of Interstate 880 partitions into separate branches both to the San Francisco-Oakland Bay Bridge approach and the Maze Interchange. The western branch follows an elevated viaduct along Grand Avenue from I-80 east. Photo taken 03/27/16. Two lanes depart Interstate 80 east at the wye interchange (Exit 8A) for I-880 south to Alameda, Fremont and San Jose. 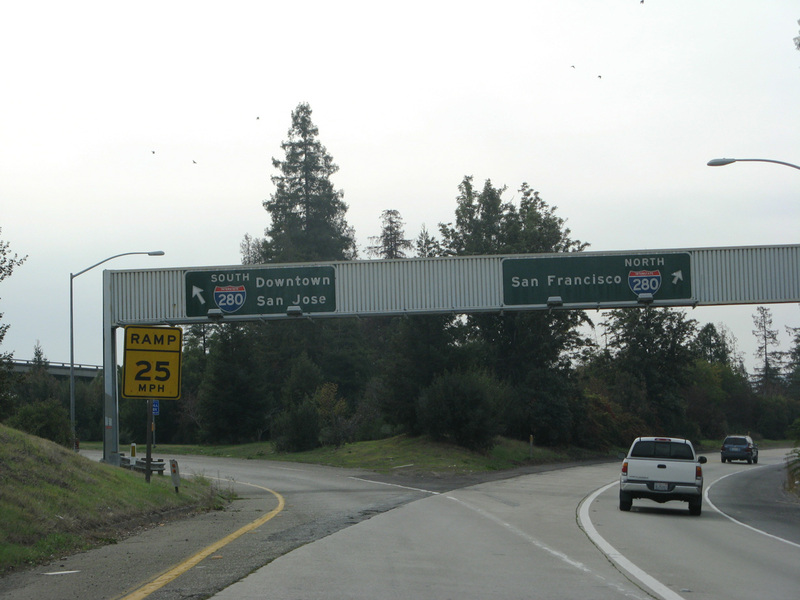 I-80 continues east into the Maze interchange with Interstate 580 (MacArthur Freeway). Photo taken 03/27/16. 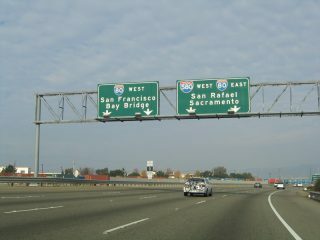 This set of signs was posted just east of the original San Francisco-Oakland Bay Bridge. A lone overhead directs motorists to I-880 south in one half mile now. Photo taken 11/29/04. 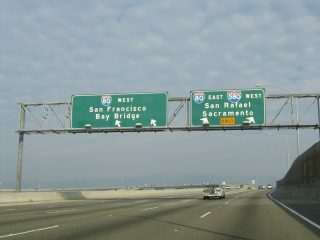 These button copy signs were also replaced during construction of the new San Francisco-Oakland Bay Bridge. 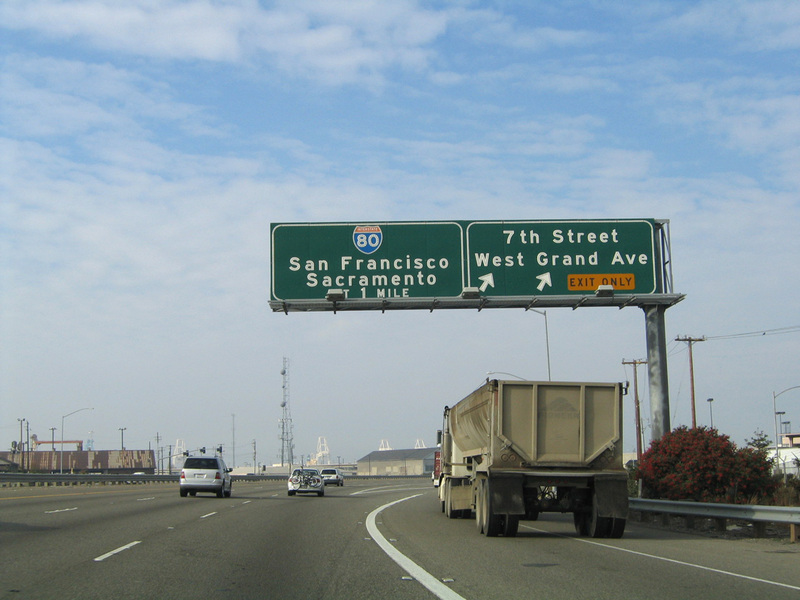 The I-580 east connection with SR 24 is reference to the left while I-880 is now signed as Exit 8A. Photo taken 11/29/04. A parclo interchange (Exit 1C) joins Interstate 880 with Stevens Creek Boulevard by Valley Fair Mall. I-880 concludes at the ensuing exchange with I-280 and SR 17. Photo taken 07/16/09. 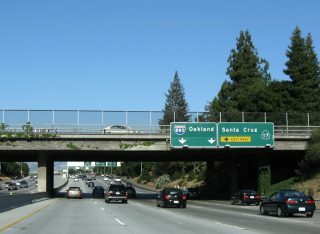 Ramps for Interstate 280 depart from I-880 and pass below the Stevens Creek Boulevard entrance ramp as the freeway transitions into California 17 south to Santa Cruz. Photo taken 07/16/09. Interstate 280 arcs northwest from San Jose by Silicon Valley toward San Francisco. Photo taken 11/25/07. 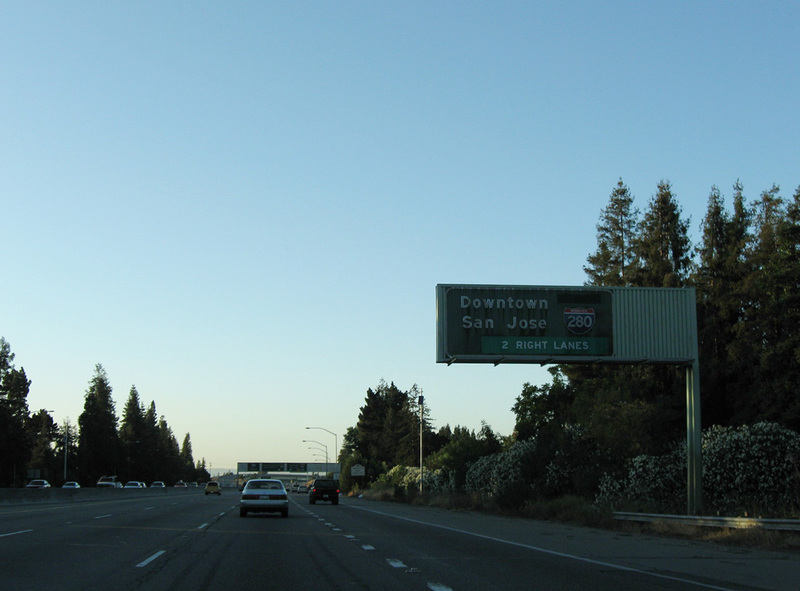 Heading east from I-880 and SR 17, Interstate 280 travels 2.9 miles to U.S. 101 and I-680 at Downtown San Jose. Photo taken 11/25/07. Advancing north toward the cloverstack interchange with Interstate 280, the first sign for I-880 appears along SR 17. Photo taken 07/16/09. 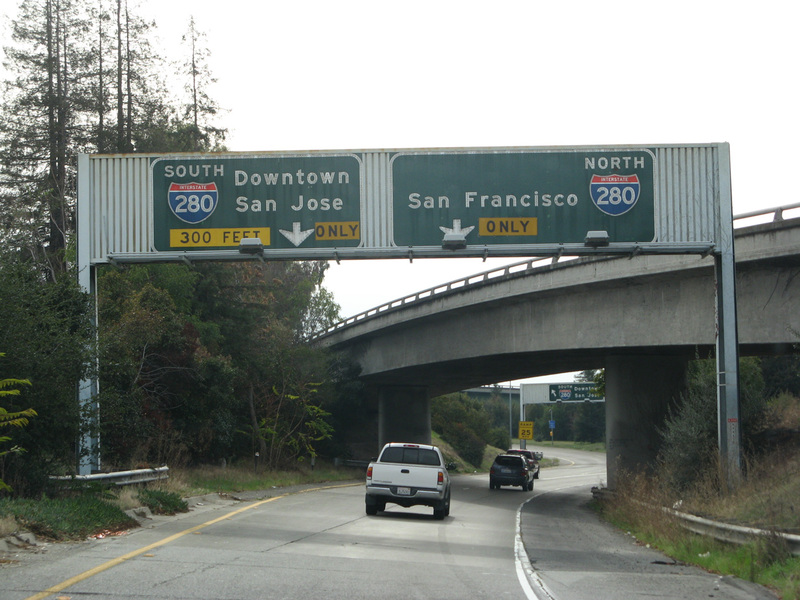 Interstate 280 originates three miles to the east at Downtown San Jose, where U.S. 101 and I-680 converge. 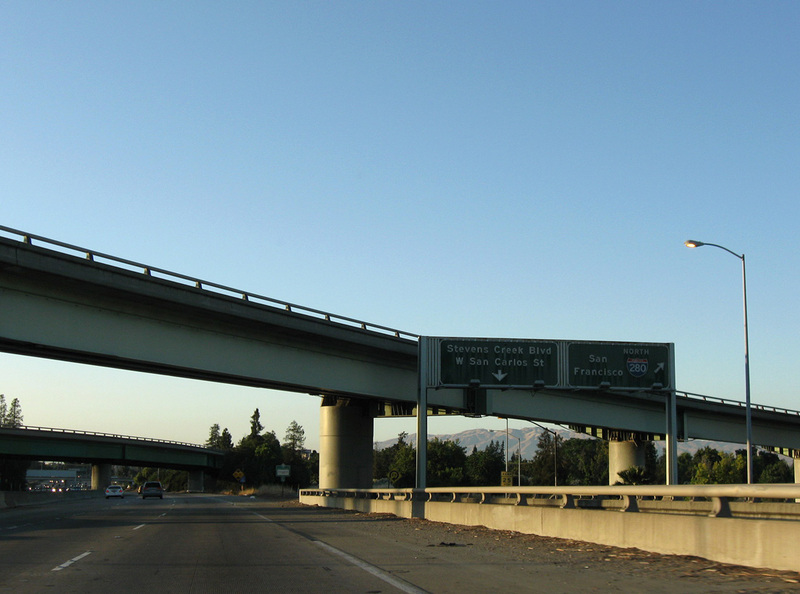 A well traveled freeway, I-280 travels toward the western edge of Silicon Valley and then north to Daly City and San Francisco, following a path well worn by the San Andreas Fault. Photo taken 07/16/09. 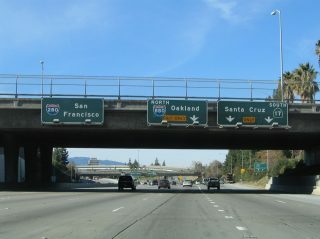 Northbound California 17 ends and Interstate 880 begins at the off-ramp to I-280 south. Photo taken 07/16/09. 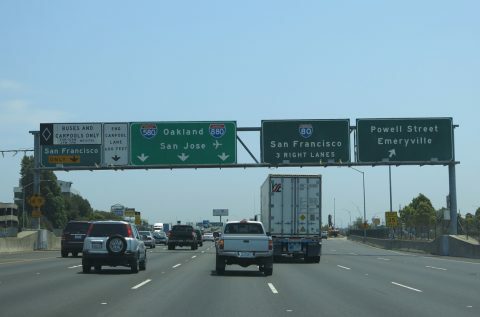 Interstate 880 north reaches the distributor roadway for Interstate 280 north. The northbound freeway retains three through lanes. Photo taken 07/16/09. A loop ramp connects with I-280 north to San Francisco; the distributor roadway continues to Stevens Creek Boulevard and West San Carlos Street at Burbank. Photo taken 07/16/09. Replaced in 2017 with a reflective sign, this overhead at the Meridian Avenue overpass predated the renumbering of SR 17 north from San Jose as Interstate 880. 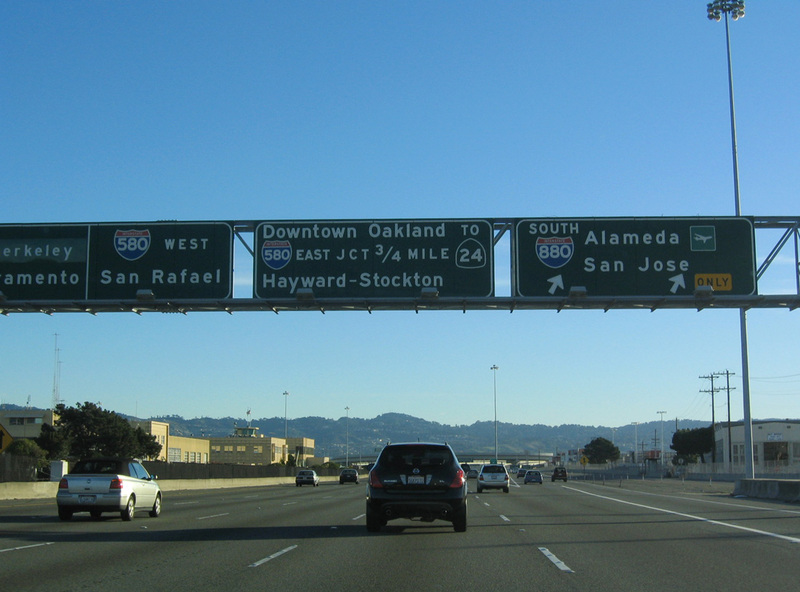 I-880 travels north toward Newark, Fremont, and Oakland, while California 17 travels south toward Santa Cruz. Photo taken 11/29/04. Construction in 2014/15 added a flyover from I-280 north to I-880 north. The addition separated traffic from the previous distributor roadway to Stevens Creek Road. 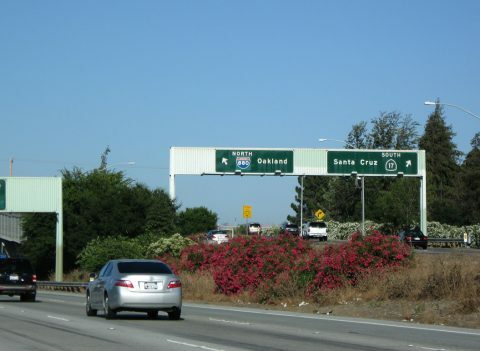 Exit 5B now departs at the Bascom Avenue over crossing for both I-880 and SR 17. Photo taken 11/29/04. The previous ramp for I-880 north (Exit 5C) joins a distributor roadway linking SR 17 north to Stevens Creek Boulevard west and San Carlos Street east. 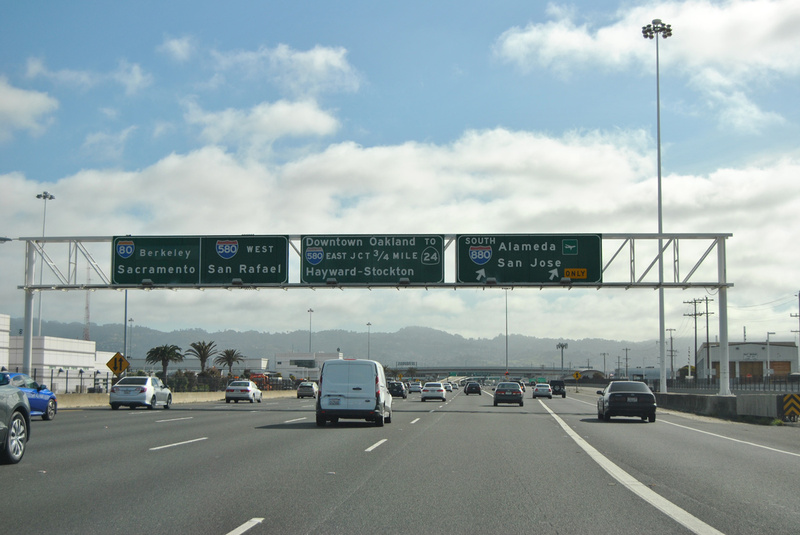 Interstate 280 continues northwest through Silicon Valley, then north toward Daly City and San Francisco. Photo taken 11/29/04. 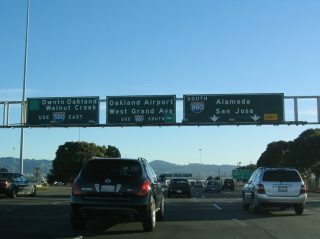 One mile north of the cloverstack interchange (Exit 5B) joining I-280 south with I-880 and California 17 at San Jose. Photo taken 07/16/09. Exit 6 leaves I-280 for Winchester Boulevard to Santa Clara and west San Jose just ahead of I-880 and SR 17. Photo taken 07/16/09. 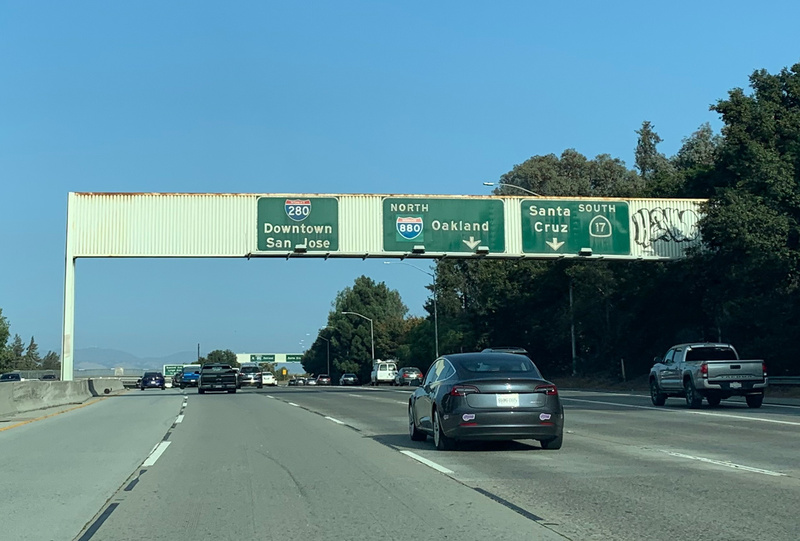 Reflective exit number signs replaced these button copy overheads for I-880 and SR 17 at the Winchester Road over crossing in 2017. Photo taken 07/16/09. Exit 5B departs I-280 southbound for I-880 north to Fremont and Oakland and SR 17 south to Los Gatos and Santa Cruz. Photo taken 07/16/09. 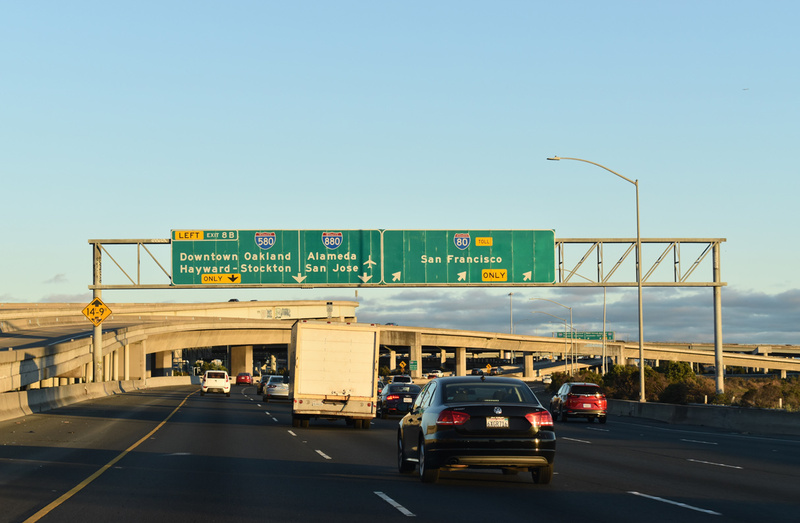 I-880 Express Lanes, Fall 2018 fact sheet. Metropolitan Transportation Commission (MTC). “Nimitz Construction reaches final stretch.” Contra Costa Times, May 8, 2005. 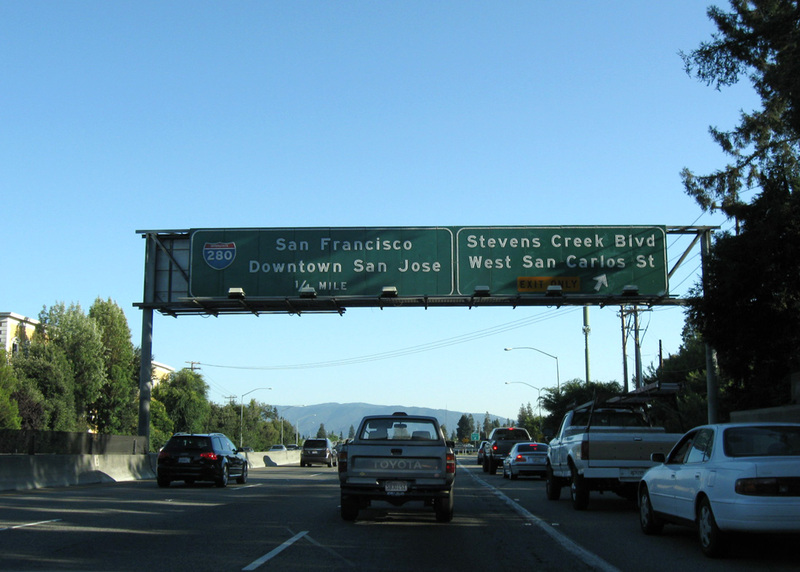 “Two new lanes to unplug bottleneck near 101.” San Jose Mercury News, October 11, 2003. 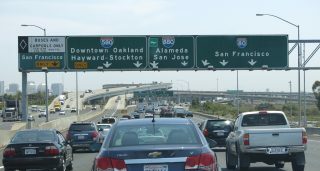 “Caltrans Opens Interstate 880 Carpool Lanes.” California Department of Transportation, news release. June 20, 2013. Page updated March 8, 2019.